Since 1991 our products have been deployed in the most hostile parts of the world, saving countless lives and billions of dollars worth of mission critical assets. Stopping bad things from happening to good people, our missions is the protection of people and assets whenever and wherever we are needed. Versatile and quick to install, use our flood barriers for wetland restoration, levee reinforcement and flood protection. Read our latest news stories and find out where our next exhibition will take place. Our body armor has protected brave servicemen and women in the military for more than 20 years. Now, with our cutting edge ballistic inserts, we provide the same protection and confidence to the heroes of law enforcement. Our products are engineered to exceed the rigorous National Institute of Justice (NIJ) standards. Tests are conducted at world-class laboratories under the most stringent protocols to ensure your armor provides complete protection. Use our Threat Performance Matrix for Stand Alone Rifle Plates as a guide for choosing the ballistic insert that best meets your specific needs. Models are listed by Series along with NIJ Threat Level (if applicable) and comparative weight/thickness followed by a list of threats each plate is designed to defeat. Tested to meet or exceed NIJ Standard-0101.06 ballistic resistance, we utilize cutting edge technology and test all of our products to the limit, giving you confidence to do your job. Other designs also tested to meet or exceed rigorous DoD standards. HESCO BALLISTIC INSERTS are manufactured to the highest quality standards at our state of the art facility in Aberdeen, Washington, USA. We specialize in the research, engineering, design, production and fulfillment of body armor solutions, using only the finest materials available, so you can rely on the performance you expect when it counts most. American-made, thinner, lighter and concealable ballistic resistant body plates put to the test. 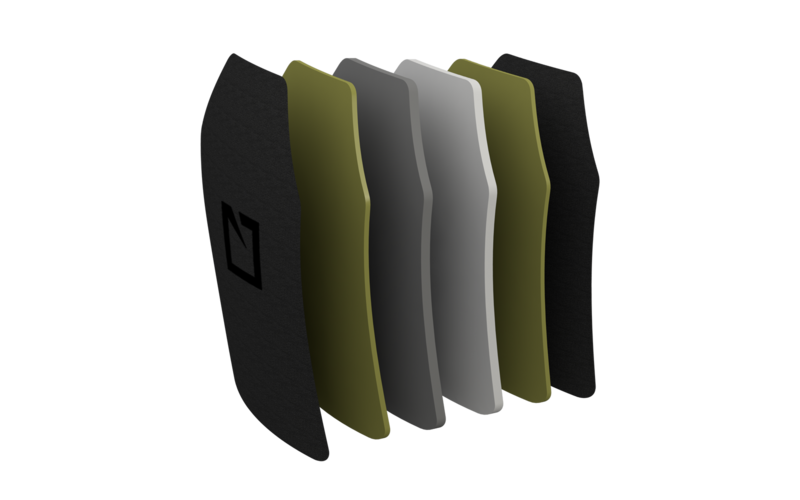 HESCO BODY ARMOR is available in a number of shapes and sizes as well as various curvatures, weights and thicknesses. A properly fitted torso plate should not interfere with the comfortable movement of the arms and shoulders. If a plate is too large, it can impede mobility and result in difficulty holding, aiming or discharging a weapon which can result in fatigue and inaccuracy. By ticking this box you are happy to receive newsletter emails from us. Open Close What is the difference between single curve and multi curve body armor plates? Improved comfort and fit is a distinguishing factor between single and multi-curve designs. The more comfortable the armor is to wear, the more likely it is to be worn. Multi-curve models are designed to fit more ergonomically and anatomically when positioned against the human torso. This translates into an improved range of motion and longer wearability in the field. Hesco offers both single and multi-curve models to accommodate most any budget. For more information contact support@hesco.com or your local Hesco Armor distributor. Open Close Which plate shape and curvature is right for me? Generally, plate shape is a matter of personal preference or a choice made at law enforcement or other department levels. Shooter Cuts with more severe shoulder angles offer an increased range of motion. SAPI Cuts with slightly less severe angles are a military cut now available for law enforcement and other use. Some users prefer Full Cut with no shoulder cut-off angles for use as a back plate. For more information contact support@hesco.com or your local Hesco Armor distributor. Open Close What NIJ Level is best for me? In addition to possible department regulations, some factors to consider regarding NIJ Level include: Select armor designed to defeat ammunition used in your own firearm or in weapons known to be used in the area you patrol; know if your armor will be used as part of an Active Shooter Kit or worn for extended periods; know what firearms are used by your workforce; be aware of sport shooting or hunting in your area. For more information contact support@hesco.com or your local Hesco Armor distributor. Open Close Why does Hesco use Cordura® to wrap plates vs. a Line-X® type polyurea spray coating? Cordura® nylon is the rugged, tear and water-resistant fabric covering used on most Hesco armor models. We also offer a sprayed-on polyurea coating by Rhino Liner® as an option on some models. Open Close Can US civilians purchase body armor? A US civilian is legally able to purchase body armor online unless that person has a felony conviction on their record...unless you live in Connecticut, where civilian body armor purchases must be made face-to-face. HESCO is a world leader and innovator in the design and manufacture of rapidly deployable barrier systems.